Where am I? > Home > News > Bournemouth - the UK's best beach? Bournemouth - the UK's best beach? A deserted Bournemouth beach in Dorset. 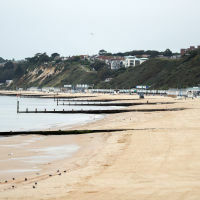 Dorset's Bournemouth Beach has been named by travellers as the best in the UK. The seven-mile long stretch of sand was also ranked number five across the whole of Europe, travel site TripAdvisor said. It was praised for offering traditional seaside attractions, beach huts for hire, water sports and stunning views of the Isle of Wight and the Isle of Purbeck. The bay has its own micro-climate, giving it some of the warmest sea temperatures in the UK. Bournemouth Beach's number one ranking was based on the quality and quantity of reviews and ratings on TripAdvisor over the past 12 months. Councillor Pat Oakley, cabinet member for tourism and leisure at Bournemouth Borough Council, said the town was "delighted and honoured" with the accolade. He went on: "We're especially thrilled with our international ranking. "As the UK's best seaside town, we're immensely proud to offer world class beaches on British shores without the need to travel abroad. "The beaches are a precious and special part of the area's natural environment and constant vigilance is required in their protection." Luskentyre on the Isle of Harris was number two on the UK list, followed by Rhossili Bay, Swansea and Brighton Beach. The number one beach in the world was named as Grace Bay, a Turks and Caicos resort in the Caribbean. Get an instant travel insurance quote now.